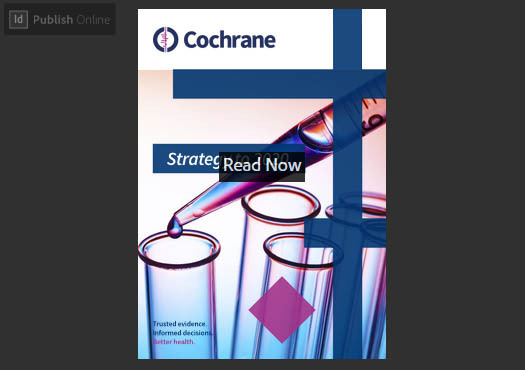 It defines how we intend to accomplish this and provides a framework for Cochrane’s future decision-making, helping us respond to the strategic opportunities and challenges that we face in the next decade and beyond. It is the result of a collaborative process undertaken by our global network of contributors; and represents the collective vision of the organization to 2020 that relies on those contributors to ensure its success. Vision: Outlines what the organization wants the world in which it operates to be. Mission: Defines the fundamental purpose of the organization, describing why it exists and what it does to achieve its vision. Goals: Establish the desired endpoints for achieving the mission. Objectives: Describe the ways in which goals will be operationalized and achieved. Targets: Represent the tangible stepping-stones on the path towards the achievement of an objective. An objective may have one or many targets that must be fulfilled to achieve it. Workplans: Set out how the targets will be achieved.